Today we at Amazing Tree Services want to discuss out tree removal prices in NJ. Please note that at this time we can only give ranged prices as ever tree is priced uniquely based on factors that we will also discuss today. For pricing on your tree, please call for a free estimate and we will be able to give you an accurate price for the tree you wish to have removed. The expense of tree removal depends upon some basic factors – Height of the tree, its condition, location and complexity of the job. Usually, the cost ranges between 150$-1500$. Apart from just cutting down the tree, there are additional costs for other services like stump removal, limb chipping etc. Extra-Large Trees (80 to 100 Feet in Height) – $1,000 to $1,500. Diameter: The diameter also plays a key role in determining the cost of cutting and stump grinding. More the diameter more is the cost. In simpler words, you would pay more for a tree that is short but thick (large in diameter) than you would for a tree that is tall but thin. The condition of the tree- strong or weak determines the complexity of the process of removing it and therefore, its price. If the tree is in a healthy and strong condition, it is difficult to remove, hence the price of removing it is more as compared to a weak, wearied tree which can be removed easily at a lower price. The place where the tree is located and its surroundings is also a prime factor in determining of cost. While removing a tree, it has to be made sure that no damage will be caused to the house or its neighborhood. If the place is away from houses and other obstacles, naturally the cost will be less. If the tree has to be removed from a domestic area, the company is bound to charge more as their job now becomes complicated. They will have to use different types of equipment and be extremely careful. Stump removal is usually not included in the cost as it is an optional service. You have to pay an additional amount if you want to get the stump removed. The equipment required for this procedure is different which is why it requires you to pay an extra amount. Its cost is determined by the diameter and condition of the stump. The cost ranges between $50 and $350 per stump. Instead of having the limbs hauled away, you can have them chipped. If the company has the chipper readily available, it does not cost a lot. If not, you might have to pay an extra 75$ to get the chipping job done. Often we'll cut the tree trunk down as far as we can without uprooting. If you want the trunk completely uprooted, the expense ranges between $50 and $100. Mostly, people who have fireplaces in their homes go for log splitting. The company is required to bring a log splitting machine along with them, you just have to inform them before hand. This service may cost up to 75$ but basically it depends on the length and thickness of the tree and the size of pieces. To learn more about our tree removal prices in NJ, please call us today at 973-343-6868 and we can come to give you a free estimate very soon. Say you own a piece of land, you probably won’t leave it there for long with deciding what to do with it. Chances are you might want to build a home, apartments, sell it or rent it to make the best income of what you have. Sometimes land can seem menacing and out of control if left unattended. The bushes or grass can grow to unseen heights and reach points where owners can’t do much than just forget about it for some time. If this is the case with your land, don’t wait for long, contact us and we will care of your land clearing. For clean removal of trees, we practically use large equipment such as a larger skid steer with a grapple attachments to uproot trees. After uprooting them and clearing the bush, we place them into manageable piles to make is easier for disposal or burning. On the other hand, chipping option is available for small jobs and a bulldozer or backhoe might be necessary for larger jobs. Every piece of land that has trees at some point is trimmed of low lying branches and dead branches too. We offer tree trimming as part of our service. We make sure by the time we are done with tree trimming, clearing and disposing of the debris, your land remains as attractive as possible. Depending on the amount of space you are going to use for your driveway, we have the necessary equipment needed for driveway clearing services. Most driveways don’t require the use of heavy equipment, making it easy to use different materials to achieve the required results. We offer land clearing services for both commercial and residential lands. Our services are valid as they incorporate all the needed services, techniques and machinery for the job. Sometimes, land clearing services involve trimming down a small area that will be turned into a garden or a similar larger area that a home, apartments or commercial house is going to be built on. No matter your need, we can offer you land clearing services per your preferences at Amazing Tree Services. To learn more about our land clearing in NJ or to learn more about us at Amazing Tree Services, please call us today at 973-343-6868. One of our tree services experts will be happy to speak to you. Of course, healthy trees that aren't too close to buildings or power lines help enhance the value and aesthetics of a property. But then what do you do when a tree is seriously diseased, decaying, or otherwise falling apart? Remember it can be an eyesore and a potential cause of injury and property damage. Truly, trees are very essential for ecological balance, you need to have it removed for your safety it the event that it is potentially hurting the environment more than it is helping. Yes, tree removal. Is your majestic oak posing a major danger for drivers, as it's starting to lean out onto the road, or is your tree causing some serious damage to your roof? It needs to go now. If you want to preserve the lush look of your landscape, then it's time to consider tree removal. Bergen county is densely populated with trees and people. While most of the time we live in harmony with one another, trees can pose a problem. We at Amazing Tree Services, we understand the delicate balance between man and nature and only wish to preserve this balance. By letting a dead or diseased remain, you are allowing great ecological risks: a dry dead tree can easily catch and spread fire, while a diseased tree can infect others. 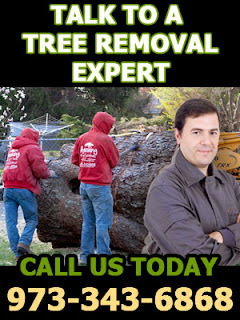 We can help by providing tree removal services in Bergen county NJ. Let’s face it; removing a tree can be a dangerous and hectic task if not done correctly. It is something that should never be attempted by someone who is not experienced in tree removal to avoid serious accidents. If you botch the tree removal it could result in a re-growth of the tree from a stump that was not handled properly. It could also lead to damage to cars, power lines, homes, and people. If you have a tree that needs to be removed it's time to consider hiring a professional tree removal service such as us at Amazing Tree Services. When you hire us, you will be assured of an excellent job. As a tree removal company, we offer services related to trees, from tree removal, tree trimming, stump removal, tree thinning to pruning. We provide services to residential as well as commercial properties. A professional tree removal specialist will start with a tree assessment and the location of the tree. To ensure that the tree is taken out safely the tree removal company will have a trimmer plan. As professionals in the field, we ensure that it is done with minimum damage to the objects around it. If the tree is close to power lines or a home the path of the fall of the tree must be calculated precisely. Once everything has been mapped out, we will climb into the tree and trim away all the major branches. By doing this it will allow for greater control over which way the tree falls. It also reduces the risks of damage caused by breaking branches and flailing limbs. No doubt, the equipment and tools required for tree removal are expensive, heavy and sharp. It is very important to handle these equipment and tools carefully or else it may cause serious injury to your body and property. So, it is always advisable to hire the services of a professional tree removal company that specializes in removing of trees and tree pruning. As professionals, we possess both expertise and experience in removing trees and handling the required equipment and tools efficiently. Frankly, tree removal is not an easy thing; hence it requires effective techniques and equipment to successfully prune or remove the tree. When you hire the services of a professional removal company then you have complete peace of mind because these expert professionals are aware with the techniques to remove trees safely and appropriately. We make use of the right tools and methodology ensuring your safety and that of your property. If you need tree removal in Bergen county, NJ, you can call us at Amazing Tree Services today at 973-343-6868. One of our tree removal specialists will be happy to speak to you.